If you have a MIDI file containing meta-events with time signature and tempo information for a piece of music, it can be imported into a Revoice track to display the bar/beat information. 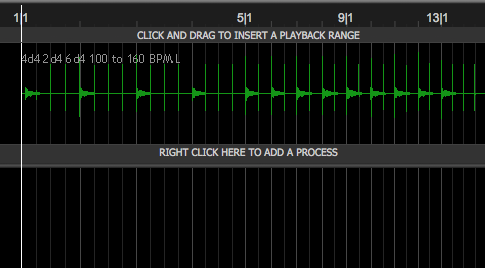 The simplest way to do this is to drag and drop a suitable MIDI file onto an audio track, as shown below. Alternatively you can use the Import MIDI File option in the File menu. 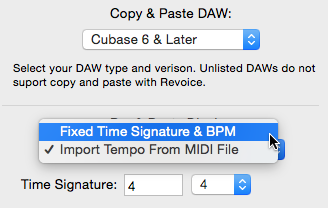 Enter the start time of the MIDI file in the Settings window, as explained in the previous section. 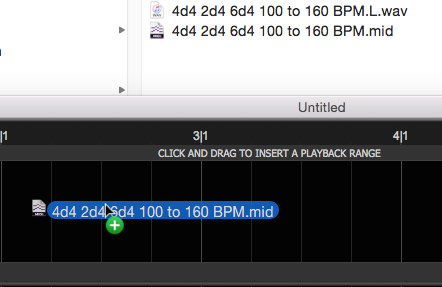 You will only see the tempo grid from the MIDI file if the start time is visible on the audio track display. Either scroll to it (if possible) or load some audio that starts at the same time. If it's not visible you will see "Bars and Beats start at ..." above the first track, as shown below. In the picture below you will see the bar/beat grid of the imported MIDI file against an audio click track that conforms to the same pattern. The tempo varies from 100 to 160 BPM up to bar 13. You can switch between the fixed tempo map and the one from the imported MIDI file using the Bar & Beat Display drop-down in the View > Settings window, as shown below.